But, ever since I started an online business and quit the rat race in 2013, I love waking up to an alarm clock. This one is a little different. It sounds like a cash register. It's the sound when my Shopify app sale alert goes off. One of my high-ticket drop shipping stores just made a sale and I probably made between $150-$1,000 or more. This happened again this morning and I woke up feeling blessed, abundant, and excited to start the day. Speaking of SE Asia, today was absolutely incredible. We are still in Ubud, Bali, Indonesia. Today was our first of 2 full days here. but first, you have to see my breakfast smoothie bowl. 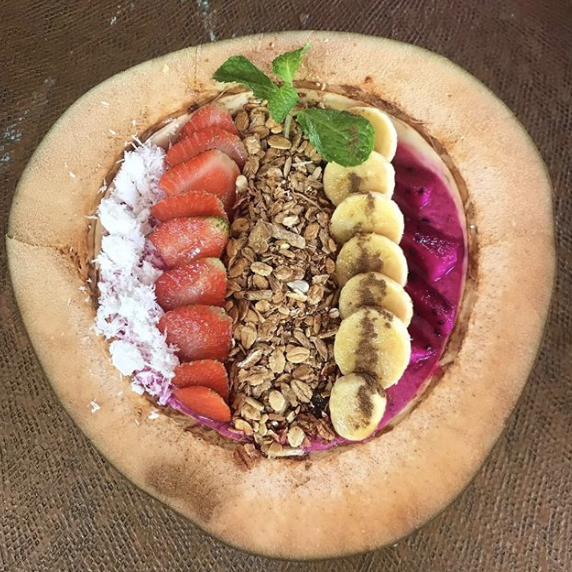 Bali is famous for smoothie bowls. It's a national world heritage site. The temple grounds have a natural spring right in the middle of it, it's very fascinating. ...but first, we took a stroll through the Monkey forest. 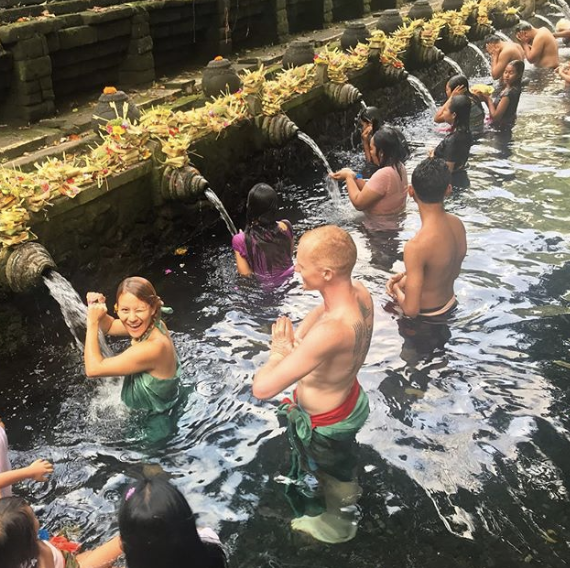 The Balinese people many many years ago built a temple atop the spring and funneled the water into spouts. For so long, this temple has served as a place of salvation for the local people and many tourists that come by every day to pray into the water spouts. We made the pilgrimage by motorbike up past the rice terraces and down through the jungle valleys until we found the temple. The experience at the temple was magical. We met a guide who told us how to take part in the ceremony appropriately and began the journey of prayers in the water. 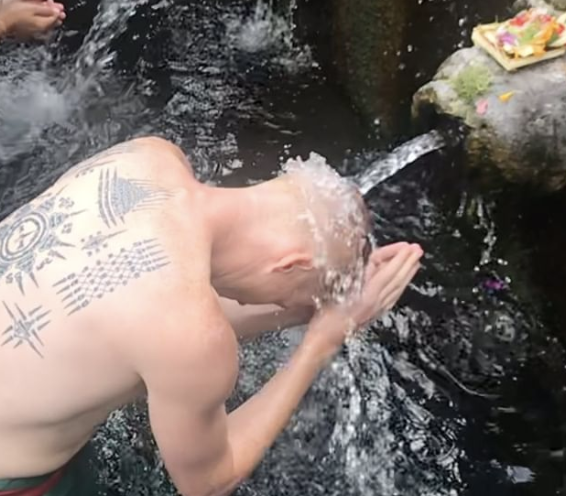 It's hot in Bali right now, around 90 degrees and humid, so the fresh cool spring water felt incredible and left me feeling relaxed and happy, surely a side effect of the meditation, prayers, and connections we made with the people there as well. I'm now home, working on various projects, mostly content, emails, and my drop shipping store. My wife and I have been traveling around Bali for the past week. 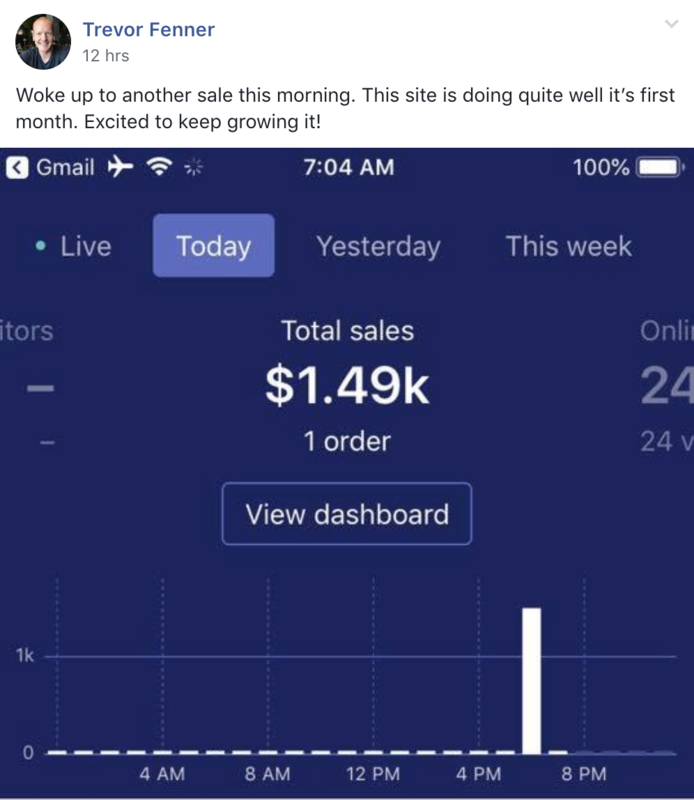 It's been an amazing adventure and our business has been making sales on autopilot the whole time. Bali is an incredible Island. You can experience so much here. You can go scuba diving off the coast of Nusa Penida and see giant manta rays, turtles, octopus, and "bola bola" sunfish. You can go to the tropical beaches of Uluwatu and surf some of the best waves in the world. You can relax beachside in Canggu or Seminyak and sip Mojitos while watching the sunset. The weather is balmy, the people are friendly, and everything is so cheap. I love Bali. I come out here at least 3-4 times a year for about one or two weeks at a time because I love it so much. Every time we come out here we discover new places and have new experiences. For instance, today we took a taxi up to Ubud, a jungle town in the middle of Bali. Ubud is one of my favorite places in the world. Everywhere you go, you feel like you're on a movie set. Stunning temples on every corner, wild jungle fauna everywhere, the most incredibly delicious food, the cheapest massages in all of Bali and so many happy people. Afterward, we ate at a really good vegan restaurant called Moksa. When we got there we saw it was an upscale spot and a similar venue in Los Angeles would be very expensive, but then we saw the menu and the dishes didn't cost more than 75,000 Rupiah each which is about $5 USD. I was blown away! I had a green juice, a turmeric juice, a chai tea latte, and a vegan filet mignon. We decided to go get massages after dinner since they are so cheap here. This is actually one of the main reasons why I live in SE Asia. Massages are on average between $5-$10 a piece per hour. When we got to the first massage place we found in Ubud, the prices were $5/hr for body massage, so I chose to try out the "four-hands" massage which is two girls. It was the best massage I've ever had in my life, and it only cost me $10 plus a $4 tip. My jaw is dropping (in my mind) whenever this happens. I have to kick myself (metaphorically speaking) all the time because it's like living in a dream out here. Ever since I first set foot on Bali, I knew this place would hold a special place in my heart for the rest of my life. The people, the culture, the food, the beach, the jungle, the temples, the low cost of living, the Balinese massages, everything about this place is amazing. I've been getting tattoos for a little while now, so I wanted to get a tattoo that represented my love for this beautiful Island and vibrant culture. When we first arrived in Ubud at our hotel Bali Bohemia, the front desk greeter asked me about my tattoos. He mentioned that one of the symbols on my chest looked a lot like the old Sanskrit symbol for ohm, meaning god. We got to talking some more and I asked him what the traditional Balinese style tattoos were. He told me about the legend of Barong and Rangda, the Balinese yin and yang. Barong, the bear, protector of the forest, was a force of good, and Rangda, the evil witch, child eater, was a force of evil and they were always battling. The people of Bali or very religious. But these tattoos come from before Hinduism, Buddhism, and Islam came to Indonesia. They date back to the native tribes and Animism, a non-organized religion that worships animal gods and even assigns god-like meaning to things such as certain words and even energy. Very cool indeed. The greeter at Bali Bohemia referred me to what he deemed as the Best Tattoo Shop in Ubud, Kings Tattoo. I was excited to go check them out because I had a really good feeling he was right. When I arrived I immediately liked the artists. Very friendly and excited to do the work. I originally wanted to get Rangda, the evil lady, on my left leg facing outwards, but in the morning I changed my mind and instead wanted to get Barong on my right leg facing outwards. It felt right. My energy is good, white light, and I want to represent my energy properly to the universe. 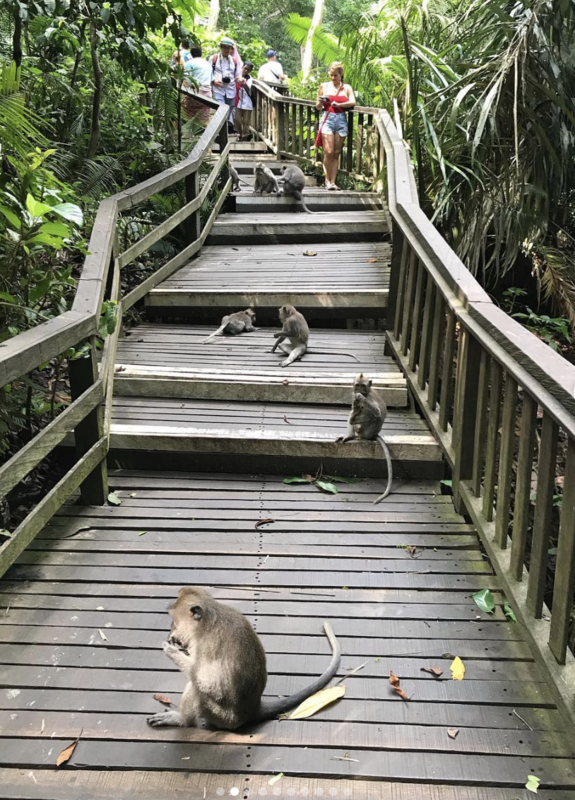 I woke up early this morning, ate some pancakes for breakfast at the hotel restaurant, rode my motorbike through the monkey forest, and got there to ask them if the change would be ok. They were cool about it, but it would take him an extra hour or so to make the new stencil. I also wanted to add a lotus flower below Barong's head and the artist was happy to do it. I made sure to eat a burrito at the taco shop next door before we started so I was feeling good. I also took some painkiller medicine to ease the pain and got my music and iPhone ready. The session was going to take 7-8 hours in total, so I would need some good distractions. This was also my very first tattoo with a machine, so it would be a new experience. So far I have a bunch of Sak Yant bamboo poke tattoos, but they are different but equally as cool. Throughout the tattooing experience I found that if I had music going and was looking at photos or watching videos, the pain wasn't so bad, and if I was having a conversation with someone via text message, it was almost unnoticeable. So I had long conversations with my mom, my friend Robby, my sister, my wife, and others. I was happy so many people were around to talk to as it made the experience much easier to deal with. We only took a few breaks about 10-15 minutes each through the whole day. I ate another burrito and some tacos. I took some more pain meds. The process was easy going. The artist is extremely skilled and did an amazing job. After it ended I was blown away. We took pictures together and I left with an amazing piece on my leg. I'm so proud of it! This tattoo took nearly 8 hours to complete. In that 8 hours, I learned some powerful lessons about success and happiness. 1. Distractions (things that make you feel better) are important, especially in times of pain and suffering. But, the best distractions happen to be music, pictures, videos, movies, and human interaction. So if you ever find yourself feeling down, plug in one of those into your life and you'll quickly feel much better. If I were to rank one above all the rest, I'd definitely say human interaction was the most powerful distraction. During the tattooing process, whenever I was conversing with someone that I didn't even notice the pain of the tattoo anymore. 2. Pain is good for you. You might not be thinking about getting a tattoo anytime soon, but the truth is that without pain, we wouldn't know how good feeling healthy and relaxed is. A lot of us suffer pain in one form or another on a daily basis and it's important to leverage the pain you feel into the energy that you can use to build your online business into a successful one. 3. Only work with the best. The reason I went to the best tattoo shop in Ubud was that a tattoo is something I'll have on my body the rest of my life and I only want the best artist to do the best work. This is the same attitude I have towards everything I do. I want my brand to stand out as the best place for entrepreneurs to learn about high-ticket drop shipping and eCommerce conversion optimization, but in order to do that, I need to make consistent quality content and market it well. It's easier said than done, but you should always put your best foot forward when creating content for your business, whether that be product descriptions, blog posts, or email messages. We leave back to Bangkok tomorrow morning. We will be there for 3 full weeks before heading back to the states to see family for the holidays and hang out with my sister who just had a baby boy. I'm very excited to meet him, his name is Henry. It's been an incredible 10 days in Bali and I will be writing a lot more posts about our adventures as time goes on. So many good memories. I plan to come back sometime in the late spring when the rainy season starts letting up, which is usually around May. We came last May and it was a great time. Bali is always a great time. Our trip to Bali was a lot of fun. I had some amazing experiences. We went scuba diving off the coast of Nusa Penida and saw giant manta rays, turtles, and huge sunfish. We visited a temple in Ubud built around a natural spring. I got a big tattoo on my right leg that took 8 hours up in the jungles of Ubud. We went surfing in Seminyak. I got some fun skate sessions in at the skateparks. It was a blast. ...but today, we flew back to Bangkok, Thailand. On the way, we got to enjoy the priority pass lounge in the Bali international airport for free thanks to our rewards credit cards. The lounge offered free food, drinks, and beer. Here I am squeezing in a broadcast email to my list just before our flight. At the Priority Pass lounge, I got an email from Russel Brunson talking about how his 10X secrets course is closing. These are often the best emails for marketers selling information products because it creates scarcity and urgency. It's usually the last emails you'll send in a launch sequence, and if you've warmed up your leads enough, you'll push them over the fence. The same goes for high-ticket drop shipping. You can send emails to your list with urgency and scarcity for your abandoned cart sequence and you are much more likely to close sales. The best thing about email marketing is that it can all be automated. His 10X Secrets funnel is on point too. Once you pay for the initial $297 for the first content, he upsells his Closing Secrets course for another $297. Then, he offers a live event for $497. I bought the first two because I love Russel and I have learned so much from him and I truly believe I'll become very wealthy thanks to his advice, not just in money but in happiness and lifestyle freedom. I've personally purchased and consumed his DotCom Secrets book, Expert Secrets book, 108 Split Tests book, Funnel Hacker Cookbook, Funnel Scripts, Funnel University, Software Secrets, and Perfect Webinar Secrets. I've learned a lot through his teachings and the same people who taught him as well. I use what I have learned to grow my online businesses and today we are doing better than ever before. The flight was easy going and relaxing. It takes about 5-6 hours to fly from Bali to Bangkok. I got some planning done on the airplane and even wrote out some review articles that I'll be posting on the blog soon. We arrived in Bangkok to beautiful blue skies and balmy humid air, just like it was when we left. We promptly got coconut water and snacks at the 7-eleven in the airport and called a Grab car for the ride home. It cost us about 350 baht, which is $10 USD. We are about an hour or so from the airport depending on traffic. As soon as we got home it was straight to the shower, then I packed my stuff up and headed out to the local vegan restaurant Vegenerie. I love this spot because the food is really healthy and moderately priced. I eat tons of papaya salad and mushroom tom yum here all the time. Along with a cup of hot green tea, it's the best meal; very relaxing. Or, as they say in Thailand. Sabai Sabai. I'm excited to get back into the swing of creating video content this week. I have plans to add a lot more content to my high-ticket drop shipping masterclass as well as my Youtube channel, podcast, and blog. I'm also figuring out my email marketing platform better so I can communicate more relevantly with each of my leads. The most important takeaway from today was to stay focused, productive, motivated, and yet take breaks when you need to so you're always sharp and ready to move fast. Speaking of breaks, I'm going to go get a massage right now down the street.